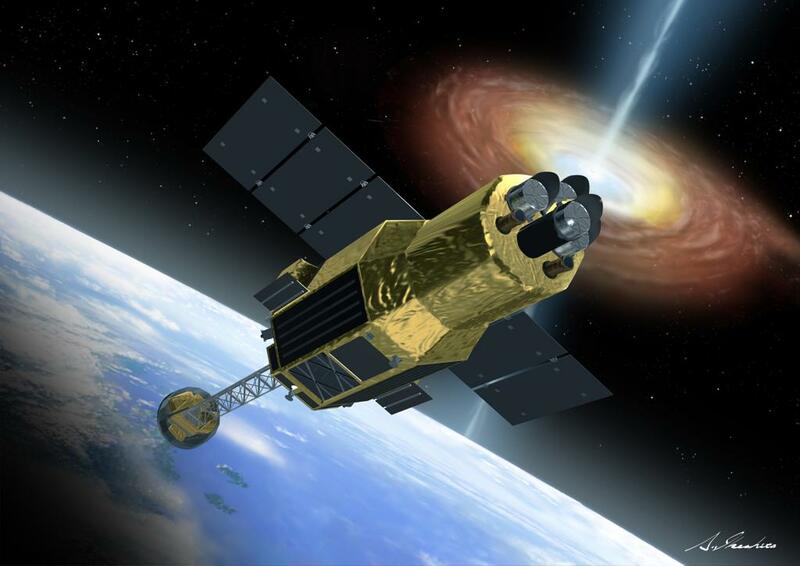 Japan’s Hitomi space observatory, launched back in February, suffered a serious in-flight anomaly on Saturday. The 2,700-Kilogram spacecraft unexpectedly ceased communications with Earth and orbital tracking showed that the satellite encountered a sudden loss of altitude and at least five pieces of debris were liberated from the spacecraft – indicating Hitomi was involved in some type of energetic event. Hitomi was launched as Astro-H on February 17 atop an H-IIA rocket lifting off from Japan’s picturesque Tanegashima Space Center. The spacecraft was re-named Hitomi shortly after the successful launch, its name standing for eye, specifically the pupil – an apt name for a mission peering deep into the universe to become the sharpest eye in the X-ray universe. For two weeks after liftoff, the Spacecraft went through its Critical Sequence comprising a series of deployment events and reconfigurations to prepare the observatory for operation. 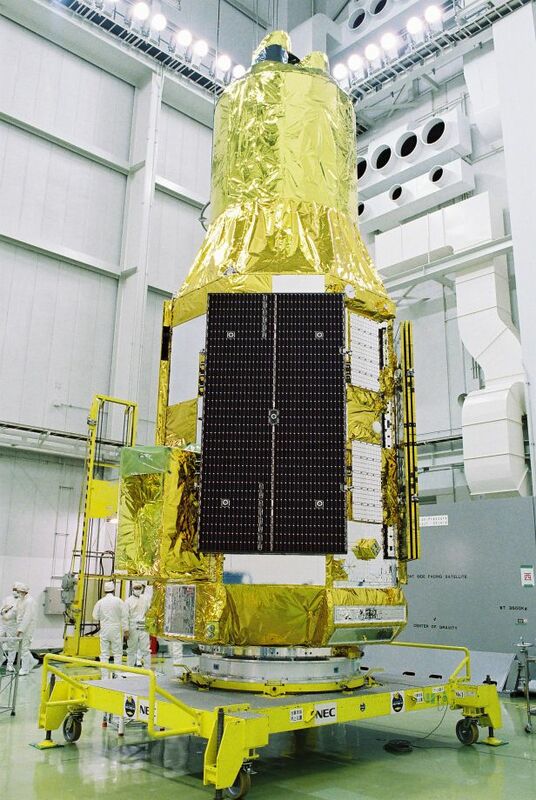 Hitomi extended a 6.3-meter Optical Bench, powered up its core systems and started cooling the sensitive instrument detectors before starting initial observations for instrument characterization and calibration, a mission phase expected to last three months. On Saturday at 7:40 UTC, Hitomi failed to check in with a ground stations during a regularly scheduled communications session. 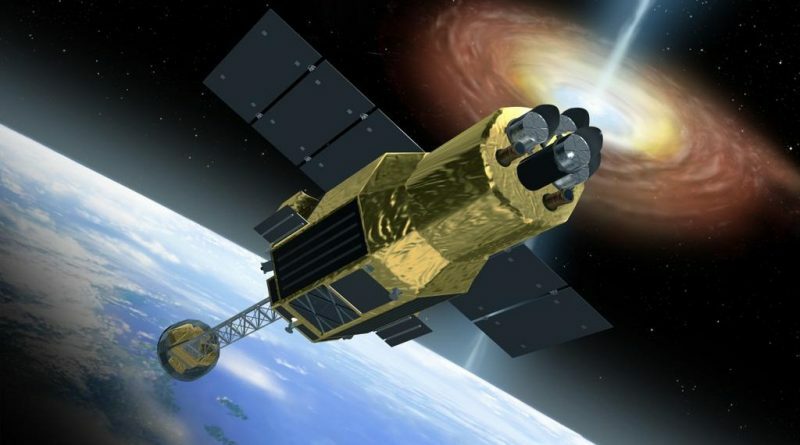 A short signal was received from the satellite some time after the anomaly first occurred, the Japanese Aerospace Exploration Agency said in a press release. The Joint Space Operations Center issued a notification on Sunday, informing that Hitomi was involved in a debris-creating event at approximately 8:20 UTC on Saturday, later revised to a more precise estimate of 01:42 UTC +/-12 minutes while traveling over the Pacific Ocean, Latin America, the Gulf of Mexico and the Atlantic Ocean. Five pieces of debris were tracked as of 14 UTC on Sunday. Tracking data of Hitomi itself showed a sudden change of its orbit from 564.6 by 580.5 Kilometers to 559.6 by 581.1 Kilometers, confirming the satellite was involved in a propulsive event. There are a number of possible scenarios that could explain a loss of communications, the liberation of debris and the sudden change in orbital altitude. A space debris strike is one option, though an event on the satellite itself appears to be more likely given the satellite had only launched a few weeks ago and was still in its commissioning phase. There are a number of components on the satellite that could be responsible for the debris generation and change in orbit, ranging from an explosion of a battery, over leaks in propellant or pressurant systems, to a loss of integrity of one of the instrument’s coolant tanks. Given the relatively small change in orbital dimensions, a leak in the craft’s propulsion system would seem unlikely. A battery explosion can generate plenty of debris as seen in a number of recent examples and it would also change a satellite’s orbit. One of Hitomi’s four instruments, the Soft X-Ray Spectrometer, contains a tank holding 30 liters of cryogenic Helium in its superfluid state to act as a heat sink and keep the instrument’s sensitive X-ray detector, a Microcalorimeter Array, at an operational temperature of 50 Milli-Kelvin, just a nudge above absolute zero. A rupture or leak within this system could be an explanation for the release of debris and the finite change of the craft’s obit. An internal energetic event such as the release of pressurized gas would overwhelm the satellite’s reaction wheels and send it into a tumble. With the satellite in constant motion, its antennas would periodically point to Earth and face the vastness of space – a good explanation for a loss of communications with occasional trickles of data. Observations conducted by Paul Maley in Arizona and Ron Lee in Colorado confirm that Hitomi is tumbling. Maley reports a ten-second period between major brightness peaks and five-second intervals for minor peaks with other brightenings seen between maxima – a typical pattern for a satellite with motion on all three axes after a destabilizing event. 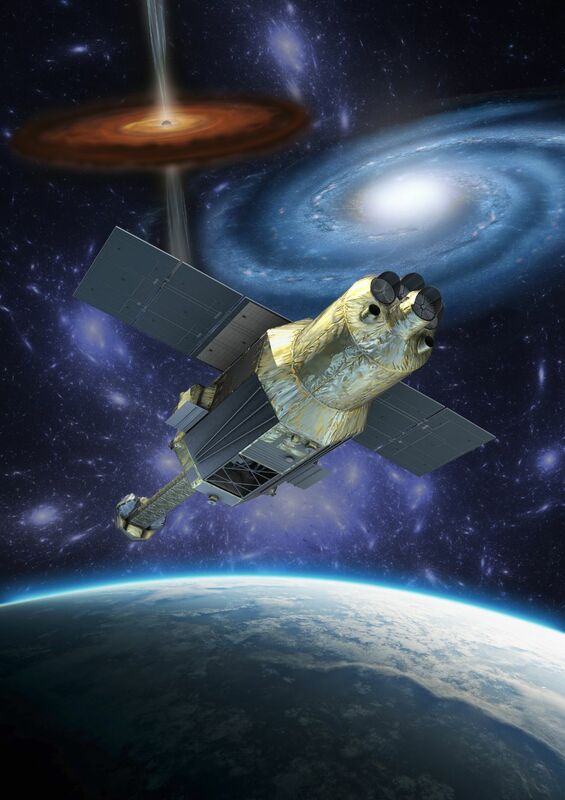 JAXA has set up a working group tasked with the recovery of the satellite and the investigation into the anomaly. Work is underway to diagnose what happened to the spacecraft and whether there is hope of regaining communications. In the event of a loss of a stable attitude, it may take the satellite some time to de-tumble and stabilize itself in an orientation that permits battery charging via the single solar panel and communications with the ground. Time will tell whether a recovery will be possible and Hitomi will be able to fulfill at least part of its mission. Hitomi was hoped to be the first mission to successfully use microcalorimeters as detectors, offering a much higher resolution than conventional CCD detectors. Microcalorimeters were previously flown on sub-orbital tests, but have not yet seen operational use in orbit after an earlier mission and launch failures. 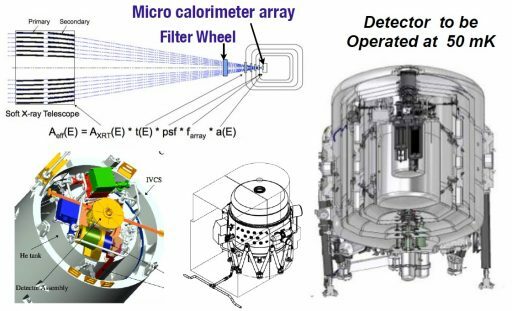 Should the Helium-based cooling system of the craft’ Soft X-Ray Spectrometer turn out to be the cause of Saturday’s anomaly, the instrument would be rendered useless and become the next failed attempt to fly a microcalorimeter in an operational space mission.